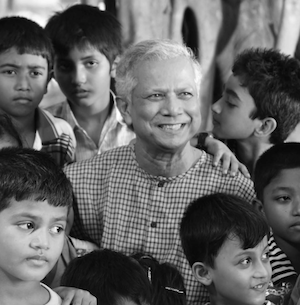 Muhammad Yunus has built a new social finance model through Grameen Bank. Since inception, Grameen has broadened its services from microfinance to telecommunications, healthcare, nutrition, and more. Yunus’ ability to build businesses for the poor has led him to receive numerous prestigious honours such as the Nobel Peace Prize in 2006 and the Presidential Medal of Freedom from President Obama. By spreading microfinance across the globe, restructuring finance markets, and advancing the field of social enterprise, Yunus has shown himself to be a true pioneer. “Muhammad Yunus revolutionised the basic tenets of business, producing a new model that targets the base-of-the-pyramid and forgoes excess profit for social impact. His creativity and innovation has transformed lives and inspired many worldwide to replicate this model for their communities.” “He is an outstanding visionary redefining international development and charity. Yunus is truly one of a kind."